As per reports, 13 people were injured on the first day of the event in Pudukkottai district. Jallikattu, a traditional bull-taming event, began in Tamil Nadu’s Madurai district on Tuesday on the occasion of Pongal. As per tradition, two bulls were released in the crowd of contestants enclosed within a fence, and each tried to grab the hump of the bull and ride it for as long as possible. 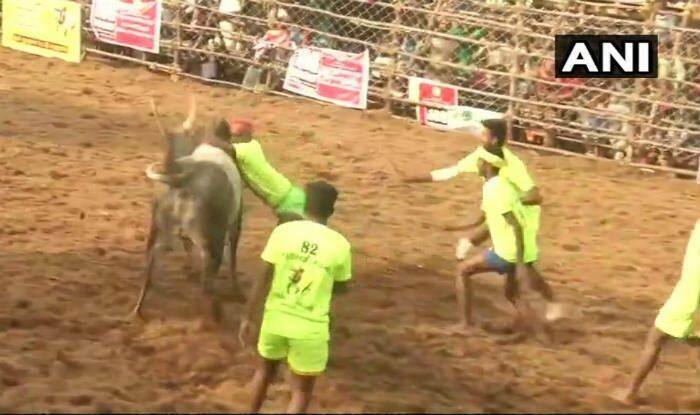 According to a daily, 44 people, including bull tamers, handlers and the general public, were injured at the Madurai event. While eight of the badly injured were sent to the Government Rajaji Hospital, they were reportedly out of danger. The Madurai district administration has also enrolled participants in a mandatory insurance scheme that is applicable in the event of death. The Jallikattu participants were reportedly asked to visit their banks to sign up for the Pradhan Mantri Suraksha Bima Yojana (PMSBY) scheme which would provide them with a risk coverage of up to Rs 2 lakh. Various organisations, including the People for the Ethical Treatment of Animals (PETA) and Animal Welfare Board of India (AWBI) had vehemently opposed Jallikattu, calling it a cruel event and asked for it to be stopped. The festival was banned by the Supreme Court in 2014 after complaints of extreme animal cruelty. However, Tamil Nadu enacted a law in 2017 to bypass the top court’s verdict, owing to massive protests challenging the ban of the event.